Read here about curved struts and their deployment in tensegrity structures. A curved strut is a strut with a visible curve in it. Curved struts are one morphology of strut: others are straight, nucleated or ringed. Historically, the first tensegrity structures featured nonlinear struts. Snelson's earliest model was the X-module, featuring a nucleated strut, and shortly thereafter produced the "Bat Wing Piece" (1948), formed from two crescent cardboard curved struts and thread. This makes Sam Lanahan's claim dubious, that he was the first to use "curved" compression members in their construction, some time after 1977 . Graham Scarr argues that a curved strut, icosahedral tensegrity provides an elegant model of the human skull, or cranial vault. The model helps understand how the cranial vault could retain its stability without relying on an expansive force from an underlying brain, a position currently unresolved. Scarr wrote: "It is important to understand that curved struts in a tensegrity dont just appear out of nowhere. The curved struts in the tensegrity cranium are at the top end of a bone hierarchy that has at least seven levels. Each of these transfers stresses down to a lower level, until they eventually dissipate at an atomic/molecular level. Hierarchies are the key to appreciating curves in a tensegrity, but the forces of tension and compression always operate in straight lines within them." The force dynamic is related to the geodesic geometry of a sphere. In his model, the tension of the dural membranes is deployed in such a way as to hold the bones of the neurocranium apart. Scarr writes in his 2007 paper, "Tensional forces in the dura mater have the effect of pushing the bones apart, whilst at the same time integrating them into a single functional unit. Sutural patency depends on the separation of cranial bones throughout normal development, and the model describes how tension in the dura mater achieves this, and influences sutural phenotype. Cells of the dura mater respond to brain expansion and influence bone growth, allowing the cranium to match the spatial requirements of the developing brain, whilst remaining one step ahead and retaining a certain amount of autonomy. The model is compatible with current understandings of normal and abnormal cranial physiology, and has a contribution to make to a hierarchical systems approach to whole body biomechanics." Converting an icosahedron into a tensegrity with straight internals then curved externals by Scarr"
Cranial vault tensegrity model, antero-lateral view by Scarr"
Tom Flemons modeled a rib cage with two pairs of curved struts. 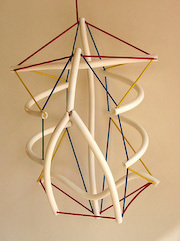 Abstract model of a spine and rib cage by Tom Flemons" link=[http://www.intensiondesigns.com/resources.html"
Pars recently constructed tensegrities with semi-circular compression members. 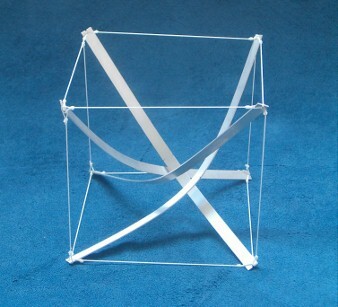 For example, Pars constructed the 4 curved strut tensegrity below: its tendons outline a cube. 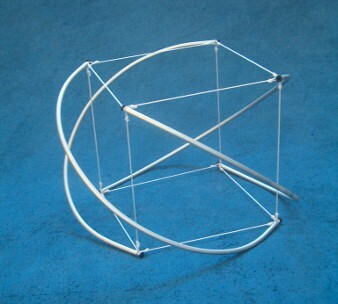 4 internal curved strut tensegrity; its tendons outline a cube. Construction and photo by Marcelo Pars." 4 external curved strut tensegrity; its tendons outline a cube. Construction and photo by Marcelo Pars." 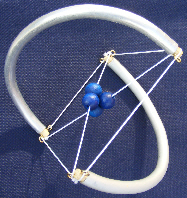 Model with 2 curved struts and tetrahedral (tetrahedron) nucleus by G. Scarr. 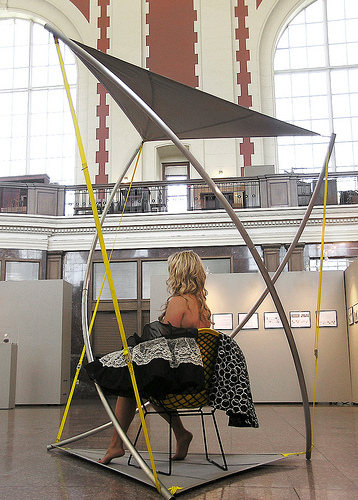 2 strut curved with tetrahedron helix nucleus by Scarr" link=[http://www.tensegrityinbiology.co.uk/biology.html"
Imbue Design won a Utah Arts Council award for its curved-strut-based Farmer's Market tent. 3 strut farmers market tent with curved struts by Imbue Design"
The pseudo-tensegrity below features a repeated 2-curved-strut module repeated three times (2x3). Its author and photographer are unknown. This page was last edited on 17 January 2019, at 08:09.